Currently I'm working in IT Security and Analysis field, but at that time I also enjoy myself to write. My writings mostly around Information Technology field. 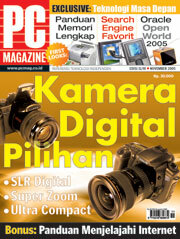 I have been writing articles for PC Magazine Indonesia for almost one and half years before it stopped its publicity in Indonesia. Those articles are not such big things, it just about Linux and how to migrate to the OS that familiar with a Penguin logo. I'm just a freelance doing so, but I realized that I love to write, hopefully this can continue in my life. And keep triing to write an article to other magazine. Eventhough, I'll try to put my articles in this web so everyone can read it, (perhaps) most of it will be in Bahasa Indonesia. It's all about my stories, such as poems, things around my head and happenings that happened to me. What people said about that? Blog? That's it, I DO BLOG! But most of the entries are written in Bahasa Indonesia, although sometimes written using my shameful English. Last updated May 26th, 2007.